Last night, Alice, my mother-in-law, gifted her daughter, my wife, Sandy, with a new quilt. I know next to nothing about quilts or quilting. (I once took all morning to sew back on a missing button, whereupon a chorus of angels sang "Hallelujah" and raised a great ruckus as they high-fived one another.) But I love everything about quilts, especially those sewn as gifts with love in every stitch. Like this one: each square is a butterfly with wings made mostly of swatches of dresses my wife once wore, some as a child and others later as a wife and mother. A better photographer than myself would do justice to the ornate piano-key border, the little childhood fabric photos of Sandy in the margins. What I love about homemade quilts is how each one tells a story. Picture Alice as she sews away the hours. The loving intent of her gift embedded with each pull of the thread. Here are dresses from recitals, plays, graduations. Here are maternity dresses. Possibly, even, funeral dresses. Alice sews through the hard seasons: a diagnosis of lymphoma, endless chemo treatments, the funerals of friends and family members. She sews in front of the TV, while riding as her husband drives her to and from doctor visits, while sitting up in bed when she can't sleep at night. She sews because it calms her. Alice sews because even "chemo brain" can't stop her. Some days are better than others, so on those days sewing gives her something to do when she does not know what to do with herself. She sews because she loves butterflies, how over time their unimaginable wings unfurl. She sews, maybe, because she knows this quilt will outlive her, that the story of how she raised her beloved daughter will be passed on. She sews because she's shy, so her needle and thread speak of this love in ways her tongue cannot. We like to joke about memory loss among senior adults. They're corny enough, but always good for a cheap laugh. Yet I'm thinking there's a gift of memory that comes only with time and maturity. My children are only beginning to get their memories back as they push thirty. Alice may not always get the details and dates right at her age, but her desire to remember is as vital and clear as ever. She wants to remember, to shake the family tree, to piece together again the story: the "who begat whom" of genealogy, the varied stories of chance meetings and hard decisions and where they led that make up family history. Things have a way of coming back to her as she ages. She seeks to take stock. Shouldn't we call such a remembrance sacred? Isn't the fitting together of a larger picture from the small bits and pieces of disparate experiences our surest antidote against the mounting losses and isolating grief of aging? Let me be clear: I'm not speaking of nostalgia, that pernicious tendency to avoid the precious demands of the present and the future by retreating into some idealized past. Sure, I'd love to retrace Route 66 one day, but I'll take that trip, thank you very much, with air-conditioning, wifi, and no "whites only" diners and motels along the way. Again, the sacred memory re-members, figures out an imaginative and loving way to quilt together all the myriad pieces that tend to get lost,forgotten, or lopped off as unforgiven. I have a hunch that sacred memory is a special grace for those up in years. Perhaps, because of the lived reality of death. We cross the line from the abstract to the concrete, from "everyone dies one day" to "I will die one day soon." Not only does death draw in close and personal, but for the person of faith, death also begins to lose its teeth. Think about it. All those years of sacred recollection begin to take hold, years of taking up the bread and the cup in a celebrative "remembrance" of Christ's Last Supper, of "proclaiming" the Lord's death. All those times we addressed the departed faithful as living members of the "communion of saints." Everywhere death, everywhere the hum and joy of the much moreness of life. With each good-bye, a new kind of hello begins to be conceived and set in motion. 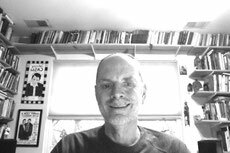 Communion shifts from a nice ritual to a core reality. I'm a lifelong baptist, but I love being apprenticed by the larger community in Christ. The late Donald Sheehan's book of essays, The Grace of Incorruption, offers compelling insight from the Orthodox faith. In an essay on Dostoevsky's Brothers Karamazov, he speaks of the Orthodox notion of Memory Eternal, the sense that the dead in faith continue "to act back into the lives of those who continue to love him or her" (p. 30). I'm struck by how this notion weds loving memory and resurrection. When we remember the deceased or, I might add, even the "dead" events of long ago, more is at play than the simple use of our memories to recall a face or draw up the specific details of what happened. Nor are we merely conjuring by sheer will some sort of adventure in wishful thinking. Instead, each remembrance is "live," since "death on earth is defeated by unceasing aliveness in God" (ibid). Such is the grace of Memory Eternal. For years I had to drive all the way to Little Rock, some seven hours from St. Louis, to visit with my buddy Tom Logue. These days, since he died, I visit with him most every day. The only difference is his jokes are funny now. I love this man. And I thank God daily that Tom lives and continues to "back into my life." To bring all this home, Sheehan notes a scene in Brothers Karamazov where Alyosha kneels by the coffin of his spiritual father, Elder Zosima. As he half prays and dozes, Alyosha enters into a vision where he sees Father Zosima sitting at the wedding table in Cana with Jesus. Alyosha wonders, "Why, he is in the coffin . . . But here too." He listens to his beloved teacher. Then Alyosha "suddenly falls to earth, weeping in joy and kissing the earth; and the Elder's voice rings again in Alyosha's soul: 'Water the earth with the tears of your joy, and love those tears . . .' The narrator then says: 'It was as if threads from all those innumerable worlds of God came together in his soul, and it was trembling all over, "touching other worlds"' (ibid.). Strange, I know. This trembling of all God's worlds, this bleeding together of life and death. But unless the resurrected life is about real life, the kind of life that surely dies, but even more surely rises again as Christ himself rose, unless God re-members us again, piece by piece, by name, as the peculiar, crooked-grinned, beloved presence we are, then we're simply fooling ourselves. Perhaps more to the point, we are being fooled by ourselves, for we are then locked into that tight-fisted, fearful place where we're chasing our tails, desperately seeking to find ourselves in ourselves. Through Christ, however, we've been opened up by the gift of the Risen Life that sets us free to know "that we are precious not in our self-assertion but only in our self-emptying" (p. 31). We can let ourselves go because it's never too late,. We can sew away without self-regard. Surrender ourselves to our deepest intent. Lose ourselves in whatever gift we hope to offer to this world God loves through and through. We can do these things without pretense or self-conceit because we know that such life and love is always ever just getting under way. Years from now, someone will happen upon Alice's quilt. She may note a missing thread or a stitched-in patch or two. He may be drawn to how the colors have faded, wonder how long it's been folded away in this attic trunk. But mostly, as children, grandchildren or great-grandchildren, they may be apt to recall a woman named Sandy whose life they knew and loved, or only knew indirectly by others. That life would have been sewn into the very fabric by another woman named Alice. These names may be recalled, or maybe not, depending on the time passed. But if these children are people of faith, they will know that somewhere, somehow, in a relational place larger than even their own hearts, both the one for whom the quilt was made, and quilt's maker herself, live on even now in Christ's risen body. "We do not live to ourselves, and we do not die to ourselves. If we live, we live to the Lord, and if we die, we die to the Lord; so then, whether we live or whether we die, we are the Lord's. For to this end Christ died and lived again, so that he might be Lord of both the dead and the living" (Romans 14:7-8). 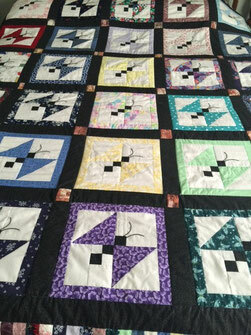 what a gift--both the quilt and the blog. feel so blessed to have read and shared the mother-daughter bond the quilt symbolizes. grateful to consider romans 14:7 in new light. Em, thank you. Thanks so much for reading this one. I'm glad it spoke to you. I'm so glad to be quilted together in Christ! Thank you, Terry, for this beautiful post. A table of remembrance and thanksgiving sits "front and center" in most churches, and, at the very least, it won't let us forget that we are never forgotten. I resonate with the notion, which you so skillfully and movingly explore, of "Memory Eternal." Thanks again. Polacco, Patricia "The keeping quilt"
Terry, your lovely blog reminded me of a favorite children's book which I listed above. The quilt in this story is made of the clothing of Jewish relatives left home in Russia when the rest of the family came to the USA. It literally lives through the years in every aspect of the family's life. I heard Patricia read this book aloud to a group and she carried the actual quilt with her for us to see with our own eyes. It was powerful just as your blog is.. What a lovely gift Sandy's mother has given for many years of the life of your children and later their children to embrace. Nancy Check for a wonderful review of the book and a photo of the cover on the internet. I just typed quilt childrens book but you have the author and title and surely will find it easily. Thank you, Guy. Yes, never forgotten! That's so beautiful. Nancy, what a wonderful post. I'll be sure and check out the book, but I'd love to hear you read it to us, like you did so well at Broadneck. Memory Eternal. What an interesting idea. I would like to ponder that and learn more about it. Thanks Terry. You're on a roll, Terry. You turn everything to gold. Thank you. Belden, thanks so much. I miss you, brother. I need a Belden Fix! I'll be in touch soon after Zak's wedding. Carolyn, I've been living with this notion of Eternal Memory for a little while, and I've got to say that I love the resonance of it, especially how the deceased ones we remember in love are also remembering us. I grew up with the first part of that, but not always the latter part. It's clear from scripture's sense of a "great cloud of witnesses," that that our loving memory has such reciprocity to it, that it moves mutually, both ways a loving gaze. Such a blessing to read this, Terry. My mom found lots of quilts and pieces and has given them to all her kids and grandkids through the years. This has touched my soul as I think of her and those that are no longer here, but will one day see again. Dave, I'm so glad you found this to be a blessing, as your friendship is a good and gracious blessing to me! Great to hear from you. Gosh, Terry, there's a lot to consider in this post. 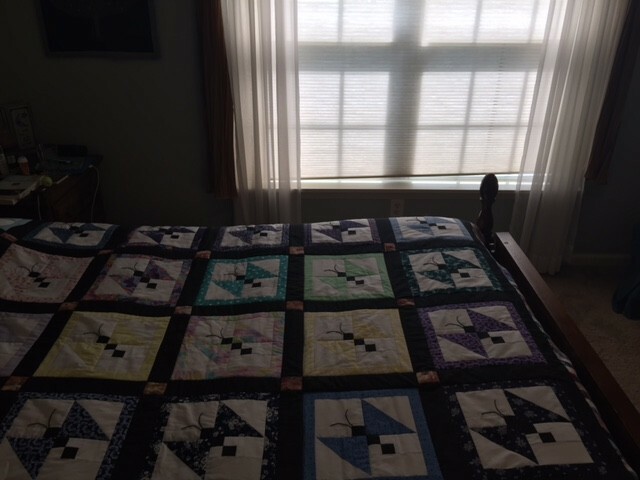 I have a king-sized 4" block quilt, hand-stiched and quilted by my grandmother, on my bed. The amount of work it took to put the blocks together is simply mind-boggling for me. And yet, each block goes together to form this pattern that forms one way and with a turn of a head another pattern forms a different way. She made this quilt she was 88 years old; she is still quilting at 91. What gives these quilters the tenacity to take on such as task and find fulfillment? All I think of with quilting is aggravation. God as a quilter, an interesting image, I'd say. Andrea, yours is such a heartfelt, honest response. I agree wholeheartedly: quilting is a beautiful metaphor for how God's active love "holds" creation together, helps it cohere. All photographs on this website, unless otherwise credited, are property of Terry Minchow-Proffitt.